The pattern for this wool felt cushion is by Sue Spargo. She is returning to Amitie this year to do another workshop and will no doubt bring with her more designs to tempt me. I must admit, I had never done wool embroidery before, but did love it. Yay, a lovely new blog to follow! I love the colours in your cushion. I bet it looks gorgeous somewhere comfy in your home. 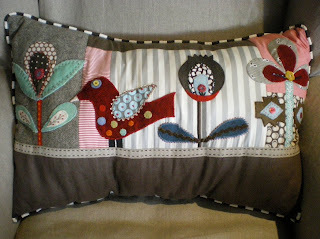 Welcome to blogging land... do love these cushions and would like to join you in the class..
i love this cushion - the colours, the wool embroidery. very inspirational, thanks.